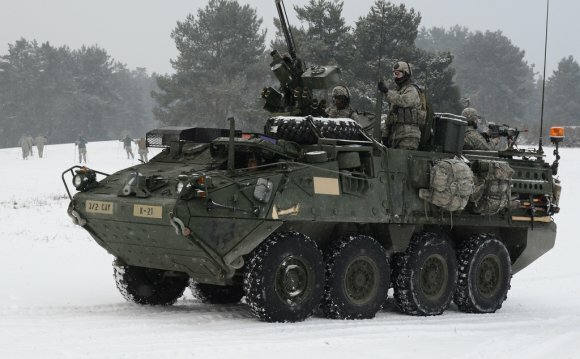 The mission of the 2nd Stryker Cavalry Regiment is to conduct ARFORGEN Operations to restore combat capacity in order to support Seventh US Army and future Central Command contingency operations. Prior to its reorganization as a Stryker unit of action, the Regiment's mission was to, upon receiving orders, rapidly deploy and execute reconnaissance and security operations anywhere in the world and be prepared to fight upon arrival and win. The 2d Armored Cavalry Regiment had the distinction of being the "Longest Active Serving Cavalry Regiment in the United States Army." The 2nd Stryker Cavalry was first constitued on 23 May 1836 as the 2nd Regiment of Dragoons to fight in the Florida Seminole Indian Campaigns. The Dragoon, a mounted infantryman, was deemed the most capable to defeat the agile and elusive Seminole. Following action against the Seminole, the Regiment went on to serve in the Mexican-American War, the Civil War, the Spanish-American War, the Philippine Insurrection, the Punitive Expeditions in Mexico, the First World War and the Second World War. Following the end of World War II, what had become the 2nd Armored Cavalry Regiment remained in Germany, where it would be stationed for almost a half century. During the Cold War era, what was then the 2nd Armored Cavalry Regiment was responsible for surveillance of 731 kilometers along the Iron Curtain. Its section included 375 kilometers of the border separating West and East Germany, as well as the entire 356 kilometers of the West German-Czechoslovakian border. From a distance the border area appeared deceptively peaceful and scenic. Closer inspection however revealed the Iron Curtain's massive and deadly barrier system. Its series of metal mesh fences topped with barbed wire and equipped with sensitive warning devices, guard towers with interlocking fields of observation, and concrete walls similar to those found in Berlin were an imposing deterrent to those on both sides. Only a few legal crossing points existed and these were heavily guarded and fortified. The former East German and Czech border commands consisted of hand picked individuals who were considered politically reliable and were well-trained in marksmanship and surveillance skills. The low number of successful escapes from East Germany, normally about 25 a year in the 2nd Armored Cavalry Regiment sector, testified to the deadly efficiency of the barrier system. The Walt Disney feature film "Flight to Freedom" depicted a successful escape by a family from East Germany into the Regiment's border region. To conduct continuous border surveillance in sector, the Regiment operated 6 border camps in addition to the home garrisons of the squadrons. Camp Harris located in the town of Coberg, Kingsley Barracks in Hof, Camp Gates in Brand, Camp Pitman in Weiden, Camp Reed in Rosts, and Camp May in Regen. From the border camps, 2nd Armored Cavalry Regiment units patrolled their border sectors both by vehicle and on foot. Helicopters from the 4th Squadron assisted from the air. At each border camp, a reaction force was kept on standby around the clock and could clear the camp within minutes of the alert horn sounding. The Regiment also worked closely with the German border agencies, the BGS (Bundesgrenzshutz) and BBP (Bavarian Border Patrol), and the ZOLL (customs) Police, sharing intelligence information and conducting joint patrols. The mission of the Regiment demanded the constant vigilance and dedication of all the soldiers stationed along the wall. In November of 1989, the 2nd Armored Cavalry Regiment witnessed the opening of the Iron Curtain. With the fall of the communist bloc in Eastern Europe, regular border patrols were discontinued on 1 March 1990, ending the Cold War phase of the Regiment's history. On 8 November 1990, the Regiment was in the process of redefining its post-Cold War mission when it was alerted for deployment to Saudi Arabia. On 11 November 1990, what had been VII Corps' initial instructions to "move no earlier than 20 November" became "begin movement tomorrow." Leading the VII Corps deployment to Saudi Arabia, the Regiment occupied assembly areas deep in the Saudi desert by mid-December. There, intensive training and planning for the ground offensive took place for several months. The 210th Artillery Brigade, AH-64A Apache helicopters of the 2-1st Aviation, the 82nd Engineer Battalion, and other assets were added to form the 8, 500 strong "Dragoon Battle Group."